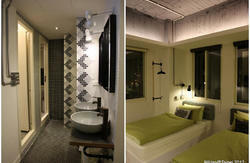 Mango53 Inn is a backpacker's hostel in a 60+ years Taiwanese town house. It is remodeled and carefully preserved the nostalgic air of 50's-60's Taipei in the most historical area - Banka or Monga district. The hostel is surrounded by government-assigned historical sites, especially famous Longshan Temple showcasing traditional Chinese architecture and lively Buddhist-Taoist religious culture in Taipei. Here you can experience traditional religious-centric life, enjoy typical local food, and discover the beauty of 3 temple heritages, all in walking distance. The hostel is a stone's throw away from MRT Longshan Temple Station, and Wan Hua train station. 7-11, banks, and food stands are nearby. Many sight-seeing spots such as Longshan Temple, Herbal Street, Huaxi Street night market, and Baopilio (Heritage and Culture Education Center) are within 5-minutes walking distance. Our mission is to provide a budget accommodation for backpackers who love to explore authentic Taipei. We remodeled this prost-WWII red-brick 4-stories town house in nostalgic design to offer friendly facilities including sofa, computer, TV, guide books, kitchenette in the spacious attic as the communal area for guests to mingle with other travelers. 1. NO elevator in the hostel building. Only WW2-era steep/narrow stairways! 2. NO 24-hr reception: Front desk opens 9AM to 10PM. 3. Early check-in is possible subject to availability. Guests are welcomed to leave luggage. 4. Late check-in after 10PM requires early notice and self-check-in. 5. Shower gel and shampoo for free. Towels for hire. In-door slippers are provided. Location! Location! Location! Our hostel is a stone's throw away from MRT station. Yet we found some guests might pass by our hostel and ask for clear signage outside. We apologize we have to keep low profile just as other hostels do because of the biased local hospitality regulations toward hostel lodging in Taiwan. Luckily most our guests acclaim that getting to our hostel is a piece of cake as long as they follow the instructions and map below. By Airport Shuttle Bus - Take airport shuttle No,1819 to Taipei Main Station. It costs TWD$125 for single trip and $230 for round trip. By Taxi - Airport to Taipei city downtown costs TWD$1,200. Pick-up service is available upon request at the same rate. Buzz door bell when you arrive downstairs to get in. By Taxi - It costs around TWD$150 to our hostel. Highly recommended especially when you carry heavy luggage or travel with partners. Please simply ask cab driver to stop at No.53. Buzz door bell when you arrive downstairs to get in. By MRT - Take MRT Bannan Line (blue line going west to Yongning). Get out at MRT Longshan Temple Station. Leave from Exit 3 (A LOT of steps. So leave from Exit No.3 only if you backpack or travel light. Otherwise, elevate/escalate from Exit No.1. Take a left when you leave and it's along the road within 2-3 minutes walk. Find the orange No.53 doorplate down the street (pass a Formosa tea house at the corner of 3rd lane) Buzz door bell to get in. Wanhua Railway Station is only one block away from Mango53 Inn (5-10 minutes) and one stop away from Taipei Main Station. If you currently stay in other cities/towns and would like to get to Taipei city by train, the easiest way to Mango53 Inn is either stop at Wanhua Railway Station or transfer at Taipei Main Station. Exit from front station, walk straight along Kan-ding Road, take right turn across He-ping West Road. Pass MRT Exit No.3 and find Mango53 Inn along the road a little within 2-3 minutes walk. Find a orange No.53 doorplate down the street (pass a Formosa tea house at the corner of 3rd lane). Buzz door bell downstairs to get in.